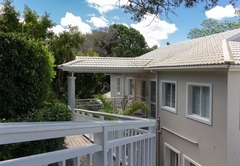 Bridgewater Manor is a 4 star graded guest house with self catering option, offering Knysna accommodation for tourists and visitors of on the Garden Route. 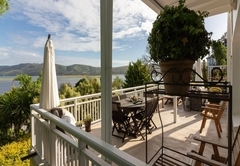 This elegant home offers warm hospitality and truly breathtaking views of the Knysna Lagoon and Heads. 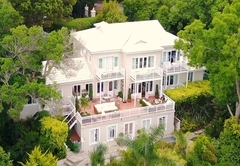 It is nestled against a hillside in the leafy suburb called Paradise, and is a 15 minute walk from town centre, restaurants and the Waterfront. 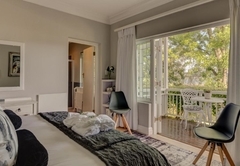 Six tastefully decorated rooms all have own balconies - five with fantastic lagoon views, one overlooking the garden rich in birdlife. 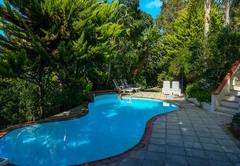 Relax at the secluded saltwater pool, wander through the lush garden where you might spot the elusive Knysna Loerie, stroll to town, or take a short drive to pristine beaches, mystical forests, and world renowned golf courses. This is an area of unrivalled natural scenic beauty, and outdoor activities abound. 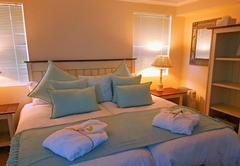 The six tastefully decorated en-suite rooms are spacious and well equipped with TV (MNet, shared DSTV), tea / coffee facilities, ceiling fans, heaters, electric blankets, hairdryers, safes, adaptors and Wi-Fi. 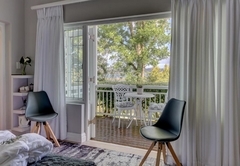 All rooms open onto their own balconies - five with magnificent lagoon views, while the sunny garden room is surrounded by flowering shrubs and birdsong. Three rooms have queen beds, the other twin beds. Twin beds can be comfortably converted to a king bed on request. The honeymoon room has a big open-plan bathroom with double shower, double vanity, raised bath with view, and toilet behind closed door. The other rooms have conventional bathrooms with either shower, or bath and shower. 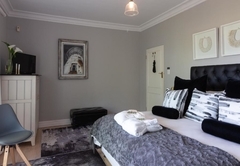 The studio offers light self-catering facilities with a microwave, fridge, toaster, and wash-up sink. All rooms are non-smoking. Ashtrays are provided on patios for outdoor smoking. No pets. 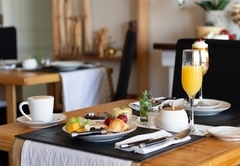 • The breakfast room which is light and airy opens onto the main patio - enjoy a healthy continental and/or full English breakfast. • Relax in the guest lounge or on the main patio, both of which have sweeping views of the lagoon. 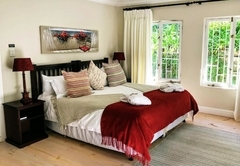 Browse through magazines or guide books on our beautiful Garden Route. 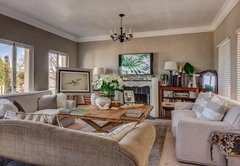 Fireplace and games for winter or rainy days. 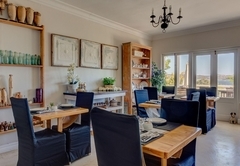 • A guest fridge for personal use and an honesty bar are available - enjoy sundowners on your own balcony or the main patio while watching the changing colours as the sun sets. 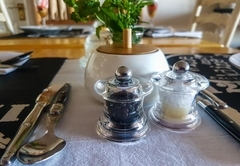 • Restaurant menus are on hand - we will gladly make dinner reservations and arrange for taxis. Most guests enjoy the 15 minute stroll in to the restaurants, but take a taxi back. • Swimming pool - laze at the saltwater pool (beach towels available), or venture onto the lagoon in our canoes. King or Twin Beds - Sea and Lagoon Facing with sweeping views from the Private Balcony. En-Suite Bathroom with Bath and Shower Facilities. Superior Room offers Egyptian Cotton linen, Exclusive Eco-Friendly Amenities and Comfortable Velour Gowns. Sweeping views from the Private Balcony. En-Suite Bathroom with Shower Facilities. Queen Bed. 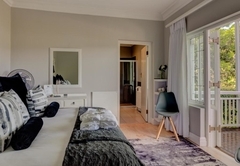 Luxury Room offers Egyptian Cotton linen, Exclusive Eco-Friendly Amenities and Comfortable Velour Gowns for your comfort and use during your stay. Deluxe Queen Honeymoon Suite, Open-Plan Bathroom with 'His and Hers' Double Vanity and Shower, Large Raised Oval Bath offering views! Private Balcony with Sweeping Lagoon/Sea Views. 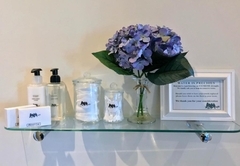 Egyptian Cotton Linen, Exclusive Eco-Friendly Amenities and Velour Gowns. Luxury Queen En-Suite Bathroom Studio (Bath and Shower). Private Balcony with Sweeping Lagoon/Sea Views. Egyptian Cotton linen, Exclusive Eco Friendly Amenities and Velour Gowns. 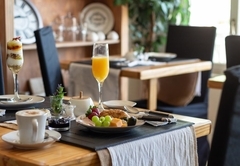 Light Self-Catering Facilities - Fridge, Microwave, Toaster etc. 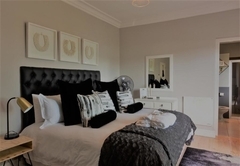 King or Twin Beds - En-Suite Bathroom with Shower . 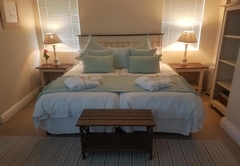 Room opens onto Private Balcony Facing Garden - Relax and Enjoy Nature and Birdsong. 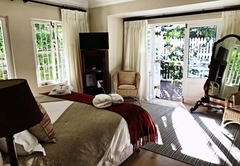 Luxury Garden Room offers Egyptian Cotton linen, Exclusive Eco-Friendly Amenities and Comfortable Velour Gowns. Response timeBridgewater Manor typically responds to requests in 5-10 minutes.